The Eden Project started life as a gigantic hole in the ground. It was once a working clay pit, but when Tim Smit saw it, he had the vision to foresee what this enormous space could become. Early sketches of the Eden Project, on pub napkins, of all places, showed giant bubbles, which is remarkably similar to how the site ended up! Building work began at the start of the millennium and by 2002 The Eden Project was ready to receive visitors. Today, the Eden Project is a world famous visitor attraction and millions of people have passed through its doors. Cornwall has some awesome beaches, but whatever the weather, there is always plenty to see and do at The Eden Project. Buy your Eden Project tickets online, making sure to take advantage of the Eden Project discount codes from vouchercloud. Next, plan what you are going to do! If the weather forecast is good, explore the outdoor attractions, including the Global Gardens and discover more about the environment on the educational outdoor play equipment. If it’s raining, you can spend more time in the Biomes, savouring the tropical heat of the rainforest and the fragrant herbal aromas of the Mediterranean Biome. Whatever the weather throws at you, a day spent inside The Eden Project is always time well spent. There are delicious food outlets, where chefs create mouth-watering dishes from locally sourced ingredients. How do I use my Eden Project discount code? Always buy your tickets for The Eden Project in advance of your visit, as it will be cheaper than paying on the day. If you buy an Advanced Annual Pass at least one day prior to your visit, you will get 10% off the full ticket price. You can also enjoy money off entry to the Lost Gardens of Heligan if you buy a combined ticket for both attractions. Other ways to save money include travelling on bicycle or foot. After all, it is an eco-friendly attraction! When is the best time to visit The Eden Project? The Eden Project tends to be busiest during school holidays and on rainy days, so if you prefer to have some space to explore the Biomes and other areas within The Eden Project, plan your visit accordingly. Can I book a guided tour of The Eden Project? Guided tours of The Eden Project are available for groups. These typically last around one hour. However, you can also book a private guided tour, which will last approximately 90 minutes. There is also a Gardener for a Day experience available for green-fingered enthusiasts. Does The Eden Project Cater for special diets? Vegetarian, vegan and gluten-free foods are available. If you need advice or you have special needs, speak to a member of staff. Can I purchase gift membership for The Eden Project? Absolutely, these are ideal for the nature lover in your life and come in adult, child, over 60 and family packs! The Eden Project is open from 10 am - 4.30 pm most days. However, it is best to check their website for opening times before you plan your visit, as they vary greatly during the seasons. 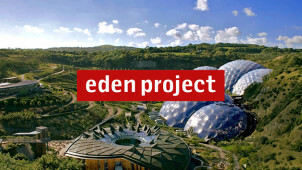 You can also reach The Eden Project online via their contact form. Looking for a day out with a difference? Look no further than the Eden Project, an iconic British attraction, famous for its rainforest and Mediterranean biomes which house thousands of species of plants from around the world. Take advantage of Eden Project discount codes from vouchercloud, and plan your trip to this must-visit attraction that gets even more beautiful with each season that goes by. From breathtaking blooms to family-friendly activities, the Eden Project is always educational and fun – whatever the weather! An all-weather family attraction, the Eden Project is positively bursting with activities all year round. From ice skating in the winter to summer evening concerts there is a busy event's calendar, plus in favourable weather conditions, adrenaline-hunters can fly headfirst down the infamous Eden Project zip wire! Look out for Eden Project Zip Wire discount to save on your ticket to fly over the gardens, waving to other visitors as you go! There’s a lot to see and do at The Eden Project, but the highlight for many visitors is a walk through the gigantic Rainforest Biome. Experience it for yourself for less when you pay for your tickets with the Eden Project vouchers from vouchercloud. The translucent biomes are especially impressive as you’ll experience four distinct rainforest environments all in one place, from South America to Africa, Southeast Asia, and tropical islands too.